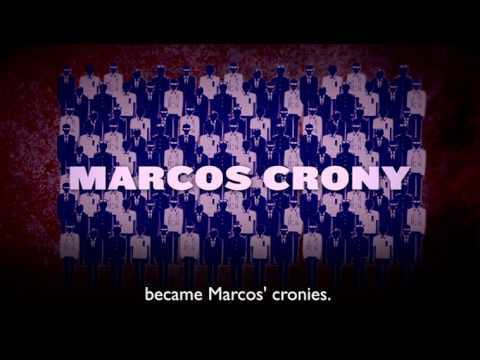 A short video explaining how greed and corrupt the former President Marcos is. His greed started when he became the president and starts to get kickbacks from various government contracts. Marcos and his wife Imelda was able to hide 950 Million dollars account in a bank in Switzerland. When Martial Law was declared, he started to claim all the wealth of the Philippine government and made his own law that gives him the authority to seize all kinds of industries. His profits increased and all of his relatives and friends are all his cronies. He forcibly gets from WWII Japanese Reparations, International Aids, Bangko Sentral ng Pilipinas, Loans from foreign countries and from the US Military Aid. Even the coconut farmers are not spared because he orders the million of farmers to pay for more than 200 million dollars worth of taxes. When the Marcos family were exiled in Hawaii, US customs list down all of the items brought by the Marcos’s that includes, crates of money, Jewelries, Gold bullion’s, deposit slips, and a solid gold statue encrusted with real diamonds. A total of 30 billion dollars are stolen by the Marcos’s and while more and more Filipinos are getting poor, the government has not yet recovered all Marcos’s ill gotten wealth.